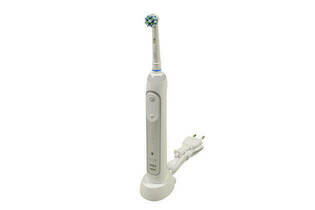 Snapshot: The Oral-B Genius 8000 electric toothbrush has a pulsating and oscillating-rotating brush action. How well does it clean teeth? Very good at removing plaque. OK at recharging battery (less than 14 hours). OK at keeping battery charge. Extremely easy to attach and remove brush head. We tested this toothbrush with 3D White and CrossAction heads. Performance results were almost identical. Oral-B Genius 8000DH is also available for $400. This is an identical model but comes with two toothbrush handles.